You'll be £19.99 closer to your next £10.00 credit when you purchase Cataphracts. What's this? Order within the next 2 hours, 10 minutes to get your order processed the next working day! Cataphracts were the most heavily armoured form of cavalry in the ancient world, with riders and mounts both clad in heavy armour. Originating among the wealthiest nobles of various central Asian steppe tribes, such as the Massegatae and Scythians, they were adopted and adapted by several major empires. The Achaemenid Persians, Seleucids, Sassanians and eventually the Romans and their Byzantine successors. Usually armed with long lances, they harnessed the mobility and mass of the horse to the durability and solid fighting power of the spear-armed phalanx. Although very expensive to equip and maintain (not least due to the need for a supply of suitable horses), they were potential battle winners and remained in use for many centuries. 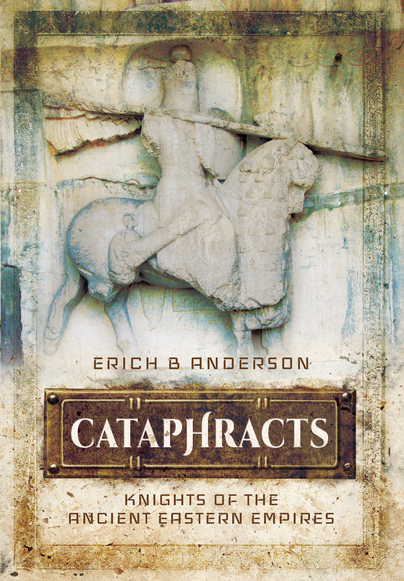 Erich B Anderson assesses the development, equipment, tactics and combat record of cataphracts (and the similar clibinarii), showing also how enemies sought to counter them. This is a valuable study of one of the most interesting weapon systems of the ancient world. goes an extra step further as to even cover the famed Byzantine cataphracts as well. This book is aimed at the general reader, rather than the more academic audience. As a result we avoid too many deeply technical discussions, and instead focus on the battlefield use of the cataphract and the development of the equipment used by them over the millennium that the type was in use. I have read somewhere that cataphracts were the “Tiger Tanks” of the ancient empires…. Heavily armored, powerful, awesome, mobile but rather slow, and very expensive. Whether cataphracts were worth the cost is an ongoing debate. This book is a detailed account of the known history and development of cataphracts. From their origins in central Asia, to the Parthians, the Persians, the Romans and finally, the Byzantines. Every battle in which the cataphracts were known to have been involved, is described in detail, with emphasis on the contribution of the cataphracts. The battle descriptions are excellent, and I enjoyed Erich B Anderson’s writing style. My only regret is that there are no maps. There are extensive notes and a bibliography for those who wish to delve deeper. I am happy to recommend this very interesting book, and to add it to my own library. This is a valuable study of one of the most interesting troop types of the ancient world. I found this book a little difficult to get into at first, but as the chapters pass I began to feel really engaged. There is more evidence in the archaeological record later on and therefore more descriptive analysis of artifacts. Also, I had no idea that there is apparently theoretical evidence of the Arthurian legend originating with a transfer of a Sarmation Cataphract to the british Isles? How cool is that! Overall Cataphracts is written really well and flows nicely. It does well to introduce and spark an interest in ancient “metal-encased horseman”. ERICH B ANDERSON is a freelance writer with a B.A. in history and anthropology from Northern Illinois University and a member of the Authors Guild. He has written numerous articles for History Today, Military History Monthly, Ancient Warfare, Medieval Warfare, Minerva, KMT, Strategy & Tactics, Military Heritage, All About History, History of War, Archaeological Diggings, History Magazine, Ancient Egypt, Renaissance and Katsujinken. He lives in Chicago, USA.